The free Anthropologie iPad app creates a playful, interactive shopping experience that will cultivate appeal for the Anthropologie brand and certainly positively impact the bottom line. Retailers–online and bricks and mortar–have a tendency to make their iPhone and iPad apps look, feel, and function just like their websites. Anthropologie’s iPad app brings added dimension to the brand’s marketing and shopping experience with expanded, exciting functionality and tools. The Anthropologie iPad app’s home screen incorporates simple navigation that clearly understates the complex machinations and tools. It only operates in landscape mode with a menu bar at the top of the screen, navigation with touches or finger swipes across the middle of the screen, or an expandable menu with thumbnail shots of your movement through the Anthropologie iPad app at the bottom of the screen. The expanding lower menu is a fantastic addition. 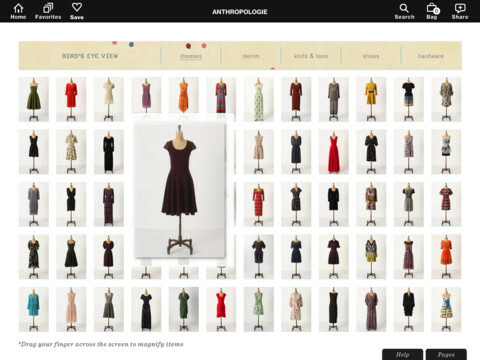 As you play with the Anthropologie iPad app, build outfits, and check out products, you can quickly and easily scroll back to a previous moment of inspiration with fewer gestures. Anthropologie’s excellent outfit builder is accessed via the “sorts and kinds” option. The screen is filled with different shapes for you to build your look. You touch the screen on the dress icon and swipe until you find a dress you like. Then, you move on to shoes and accessories. A smart inclusion is the ability to snap a photo of an item you have, so you can build a look around it. There is also a fun tool called “on the move.” There is an interesting backdrop with a modern, yet vintage graphic touch with a fabulous handbag. Then, a look pops out of the handbag piece by piece. Or, the look rolls in on a clothesline. You touch an item, and succinct item descriptions pop up. You can place an item in your shopping bag immediately. With each item, you can share your love via Facebook, Twitter, and email with one touch. Finally, the “fashion columns” feature is a refreshing take on the standard thumbnail image view of typical online retailers. The fashion columns contain images of products and fill your iPad screen. You scroll the columns up and down to visually explore the merchandise. This functionality reminds you of an Anthropologie in-store experience where you are thumbing through racks of clothes. The top menu of the Anthropologie iPad app contains a typical search icon. It is through the search icon that you access Anthropologie’s products by categories. Again, with the category search, Anthropologie incorporates smart navigation. When you select a category, you can filter products and examine them in a standard matrix view. A cool feature is the ability to move back one or two steps by simply touching the category on the screen. An arrow separates each filter, so you don’t have to click back through three screens. With one touch, you’ve moved to the exact screen. 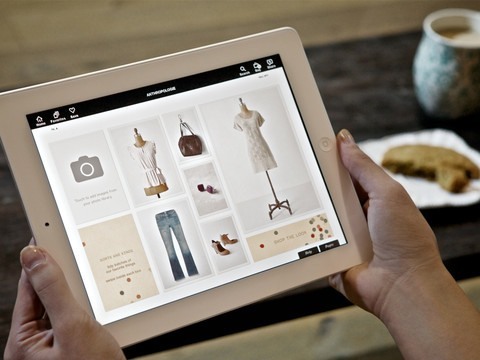 The Anthropolgie iPad app elevates the mobile retail experience. Unfortunately, I encountered problems with crashing, so the rating reflects that issue. Hopefully, the crashing will be worked out in an upcoming update. AppSafari review of Anthropologie was written by Jenni Ward on April 26th, 2012 and categorized under App Store, Free, iPad apps, Shopping. Page viewed 4575 times, 1 so far today. Need help on using these apps? Please read the Help Page.